It’s hard to believe it was just six short months ago that Reed Connor was losing his breakfast, then going on to finish an unspectacular third at the Nike South Invitational. Sure, it was a great field of runners from one of the deepest states in the country. Sure, he was barely edged by Paul Snyder for 2nd and winner Craig Lutz was running as well as any soph in the country. But Reed knew he was better than that, and that he wasn’t touching his potential. Fast forward to two months later: The Woodlands senior is all alone in the final meters at Nike Cross Nationals, sprinting away from a tight pack in a way that only Reed Connor can sprint. He’s hardly one of those distance runners you’d stick on your 4x400 team, but he’s flying away from a tight pack with stunning ease. His arms reach for the sky and a huge smile spreads across his face as he crosses the line. It is the end of a ridiculously great sequence of victories that has turned Reed from “one of Texas’s best runners” to arguably “the best runner in the country.” A few weeks later, he’ll win the Gatorade Cross-Country Athlete of the Year. Now it’s early April and the Wisconsin signee’s spring has gotten off to an inauspicious start. Yes, he ran a 4:11 mile PR indoors at Reebok Boston, and an early 9:03 3200, but the opportunity and the health – he’s struggled with a bad cough and cold in recent weeks – to blast the sub-8:50 he’s capable of hasn’t been there. 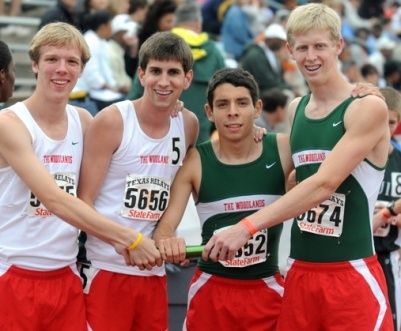 He has, however, been part of two US#1 relays and another #2 so far this spring – 17:26 4x1600, 10:06 DMR, and 7:46 4x800. Being the ultimate team player, Reed wants to defend The Woodlands 4x1 mile title at NON as much as anything else … and he trusts that fast deuce will come in due time. DyeStat’s SteveU goes out for a few easy ones with one of the sport’s most friendly and popular athletes as he prepares with his mates for districts. 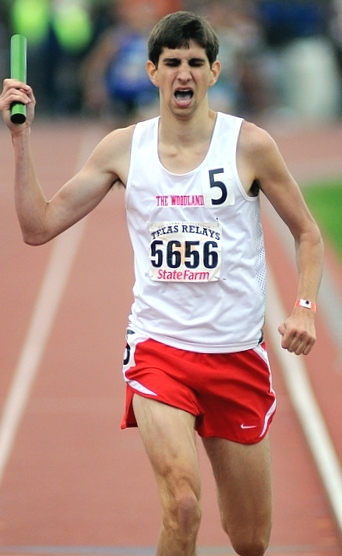 1) Reed, you and your teammates are coming off a weekend with two very strong performances at Texas Relays. You guys have a strong relay tradition, but this was your first trip to this meet. What was the experience at the big stadium like for you guys and how did it feel for everyone to get those wins and build on that tradition? Thanks, yes, our team had two very big performances this weekend and we are very pleased with the results. We knew going into the meet that there would be all the best teams in Texas and we wanted to prove ourselves in that kind of atmosphere. The big stadium experience is the arena that every athlete dreams of succeeding in and that's what we did. Our tradition is important to protect and continue building, and that's why everyone felt so accomplished after Saturday's race. 2) You guys also had a very fast 4x1600 at the Klein Relays a few weeks ago. Was some of that effort fueled by having seen the winning time at Nike Indoor (which you guys were reportedly considering, but didn’t get out to)? How motivated are you, Drew and the rest to go out to Nike Outdoor and get a title as a group? Seeing the results of NIN definitely motivated our team to try and run a fast 4x1600. Last year, we won the 4x1600 at NON and we are going to try and repeat that feat. Seeing another team run a fast time just gets us excited for NON again. What makes it better is that West Windsor-Plainsboro North is from New Jersey and one of our 4x1 Mile members, Tom Sanderson, moved from Jersey last year. He feels like it is important to prove himself against New Jersey competition and the rest of our team is going to help him succeed. 3) It’s been talked about many times on DyeStat and other media about the way you came on at the end of the season to dominate through NXN, and then win the Gatorade Award. It would be interesting to hear again – with a few months hindsight – your perspective again on how your season turned around after Nike South … from being part of the top group in Texas to becoming a dominant national champion. Please share again what happened mentally for you and what your coach and others contributed to that. Last cross country season was a dream come true. I got third at Nike South due to a lack of control of my nerves when I threw up three times before the race. After that race I told myself it wasn't worth wasting all my training and hard work just to get nervous on race day and choke. I fixed the problem by thinking about how well I was coached (Dan Green) and listening to the Beatles ("Here Comes the Sun") before each race. Basically, after I learned to stay relaxed, I went seven straight weeks with either getting a PR or a course record and on the 8th week I was the Nike Cross National champion. A feeling like that can't really be put into words, it just brings a smile to my face. 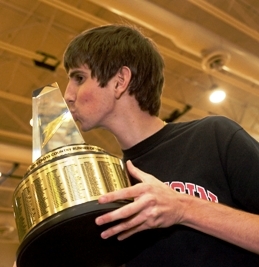 To top off the whole thing and kind of relive it for a week, I was named the Gatorade Runner of the Year in February. It is a great honor to be named with many of the other athletes who have received that award. When I look back, when I'm around 80 years old, that will probably still be my biggest accomplishment because it recognizes more than just my athletic achievement, but honors who I am as a person as well. 4) As unbeatable as you looked at the end of the season, there were also some guys you didn’t get to race. Do you think much about how you would have done at Foot Locker and how you might race guys like Solomon Haile and Trevor Dunbar? How does it play out for you? I do think about Foot Locker sometimes, but not much. I knew going into the season, I was skipping Foot Locker and going to NXN. Basically, since I had started training in the summertime, I knew December 6th was the day I had to be the best. As far as Trevor Dunbar and Solomon Haile are concerned, I do wonder what it would be like to race them. Nobody will ever know what it would have been like if I had run Foot Locker last year, but I can say it would have been very hard to beat me last cross country season; I was like a high speed train with no brakes. Even though I was on a roll, so were Haile and Dunbar, so really it was anybody's race. I'm sure we will all get a chance to race cross country against each other in college. 5) Since the end of XC, you’ve had a relatively low profile, with just the one indoor race, bypassing NIN, and running relays in Austin. Since you guys don’t get to go to Arcadia, the opportunities for a fast, competitive 3200 or 2M are starting to narrow to your TX post-season meets and (I’m assuming) Nike Outdoor. Is that something that’s concerned you at all or are you content that things will work out and you’ll be able to get a chance to run to your potential when you’re ready? This season we have been focusing on running well in the post season, and I have intentionally stayed out of some of the bigger races in order to prepare. Coach Green is always very careful never to have his runners peak too early. I am planning on running at NON. The only problem with NON is that it is so far after our state meet and we are still trying to figure out how to do both without one ruining the other. 6) Along the same lines, how have you felt so far this spring about your training and racing? I’ve heard you’ve had a few moderate health problems in recent weeks that have affected things. What’s your take on how the races have gone, and the extent to which you’ve had the training you’ve wanted? So far this spring hasn't gone incredibly well. I started off great with a PR at BIG with only base training and was really happy about that. Three weeks after BIG, my outdoor season opened and, due to heavy winds at more than one meet, I ran some mediocre times but was still pleased with the efforts. Shortly after that, things started taking a turn for the worse and due to some poor running conditions and little illness, I haven't been running the way I want to be. However, training is going well and when I get in the right races I'll be ready. 7) Before we get to the end here, let’s go back and talk about how Reed Connor got started in running. What kind of sports did you grow up playing and what led you into track and XC? Tell us about when you first discovered this talent for running … and what it was like and when you began to realize you could get to the highest levels in Texas and beyond. Who and what have been your inspirations? I was never very good at playing sports when I was younger or even now. I am just not very graceful with my movements; even when I run my form isn't very good (yes, I do realize I spend most of the race looking at the ground). I played soccer in early elementary school and then I was a basketball player for most of my childhood. I started running cross country in the 8th grade because the basketball coach wanted us to do it to get in shape. The first race I ever ran I got 57th place and I didn't get much better the entire cross country season. I didn't enjoy my time in cross country, but joined track because one of my neighbors was in it and he needed somebody to carpool with. My neighbor happened to be the best runner on the 8th grade team. In the races I would just run behind him, because he was the only person I knew on the track team, and then the last 100 meters I would outkick him and win the race. One day at track practice, we got free tee-shirts that were left over from the high school Nike South meet. I thought it was a big deal because I had to buy my own clothes and only had about seven shirts, one for each day of the week. Enjoying the Gatorade XC Athlete of the Year trophy at The Woodlands. Photos by Jeff Fitlow, Gatorade. 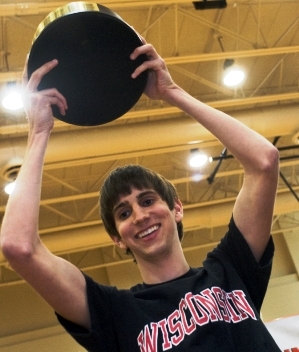 Basically, when it came time to chose a sport for high school I realized I was terrible at basketball and didn't know how to do anything else, so despite hating cross country, I joined it because I wanted more free tee-shirts. I realized I could be a good runner after the first XC season because I won all the freshman races. However, I didn't realize I could be one of the best in the nation until my sophomore track season when I started training with Alex Neff. He was the kind of kid who didn't have the most talent but he worked the hardest. He really inspired me to work hard and dream big. If it weren't for him, I wouldn't be the runner I am today. 8) Obviously, The Woodlands has been in the headlines this year not just because of what you and Drew have done, but also with your Coach Danny Green leading you guys in his final season. Going into some depth, what are some things you would say characterize Coach Green and The Woodlands program? And what would you say about your role in that during your career, especially the last several months? Some words that describe the program and Dan Green are commitment, desire, and team. Those are three pretty simple words, but they mean so much and Coach Green has committed a lifetime to helping young men to grow up and succeed in a lot more than a sport. He is totally committed to the guys on the team, the program and the sport. He expects the same level of commitment from us and our families as he gives to us. There are no exceptions. Also, in my running career Coach Green has given me the confidence and the desire to be the very best. As I said earlier, when I joined the sport I didn't really enjoy it, but he helped me to find a passion for it. His coaching, friendship, and belief in me has helped me become a better runner. That desire to be the best is not only personal, it's for the team, for the tradition, and everyone and every team that has come before at The Woodlands. 9) You will truly be heading north and into a distinctly different clime this fall when you go to Wisconsin. How did the Badgers and their program win your heart during the recruiting process, among all of the other suitors? Wisconsin is definitely a change from the Lone Star State. However, change isn't bad and is something I was looking for in the college selection process. I looked at many great schools and in the end decided on Wisconsin. Everything just kind of fit into place with the team, the coach, and their tradition. Also, one of the things that I felt was missing from my high school career is a team national XC championship. At Wisconsin, I feel I will be able to continue my individual success as well as win a team title as long as I don't freeze to death first. 10) You’re really beginning to be known for not just your running aptitude, but your school smarts and a kind of off-the-wall sense of humor, too. What kind of things, both in school and outside – in media, popular culture, etc. – motivate and inspire you? What kind of things really make you laugh? If for some reason, you couldn’t run or play other sports, where would you channel that energy? What inspires me is people who are the best at what they do ... Kenenisa Bekele, Haile Gebrselassie, Tiger Woods, Muhammed Ali, Michael Jordan. I like these people because not only did they win once, they continued to win even when the pressure was on them and the odds were against them. They are true champions. Being a compassionate person, my favorite thing to laugh at is people who do something dumb. I know it’s not good to laugh at people, but when somebody trips and falls or just makes an unexpected blunder it always makes me laugh. Unfortunately, I do those things as well so I find that it is important to be able to make fun of myself and do that quite frequently. If I couldn't participate in sports, I would concentrate my energy on Scrabble, Bingo, Go-Fish--it doesn't matter what as long as I can make it competitive.